Rural Mania is fundraising to provide solar lanterns in Kelichapada village. Join our cause!
" We make a living by what we get. We make a life by what we give.” ― Winston Churchill About the project This is a story of passion and perseverance….the journey began 3 years ago, for 2 friends , with a burning desire to make a difference in the lives of some “have nots”. After a lot of thought, discussion and debate, we identified the village where we wanted to direct our efforts. A lot of time was then spent building trust with the villagers and convincing them of our genuine desire to help them and then obtain their support for our initiative. We have made considerable progress in the last 3 years…a medical camp (a first for the village) , Sports day for the school kids, various other school activities - like a drawing competition, books distribution and biggest of them all, our mal-nutrition program, which has been running successfully for the last 9 months in 1 school of 28 kids and another school for 1 month with 25 kids….all this would not have been possible without the support of our family, friends and well-wishers who were generous to a fault. 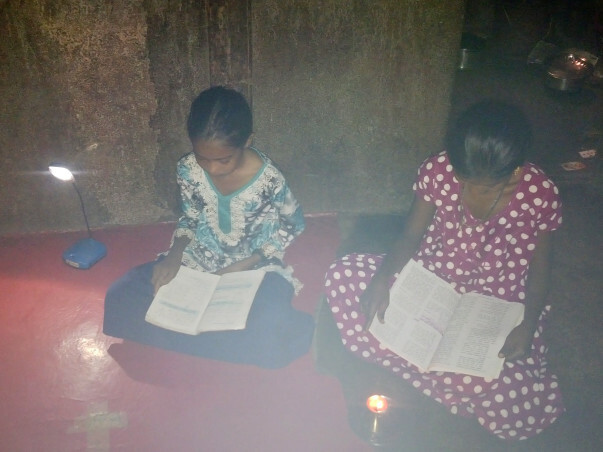 Now that the mal-nutrition programme is well-established, we'd like to help the children with their studies……as a first step we would like to provide solar Lamps to every household so that children are able to study after school hours. Power supply in the village is intermittent and often non-existent. Our endeavour is to provide Solar Lamps to the 100 houses in the village, which will enable not only the kids to use the evening time effectively, but will also assist the housewives to do something meaningful with their time past the sun light hours. We are also restoring a local building to house the library, where the solar lamps will be used to provide light for reading in the evening. We are looking for donors to contribute a minimum of Rs. 500 ($1 = INR 61) , Our aim is to collect INR 200,000, of which 150,000 will be used up to buy the lamps and 50,000 will be made available for maintenance purposes. Our tipping point will be 100,000, at which point, we can still go ahead with the lamp distribution scheme, with the difference to be borne by us. Please visit www.facebook.com/ruralmania.m to check out the project and activities.